December 2017 – Cape Design Engineering Co.
Another year has come and gone! However, this year was special as it marked CDE’s 20th year of business! We would like to take a moment to thank all of our staff, friends, clients, and associates who have supported on this ride! 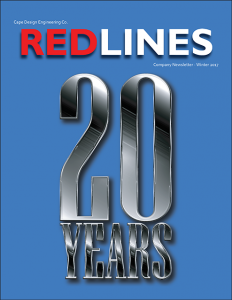 With that said, CDE is proud to present the latest edition of our newsletter – Redlines. Click on the cover below to read it!